Ahh, Penguins-Capitals; one of the NHL's most intriguing rivalries. The made-for-television drama created by pitting two of the world's greatest players against one another never fails to capture the imagination of the hockey community. It was no different last night as the two entered the contest near the top of the league's scoring race. Indeed, Nicklas Backstrom and Evgeni Malkin found themselves sitting second and fourth, respectively, in the league's assist column. What's that? Not the two you were thinking of? 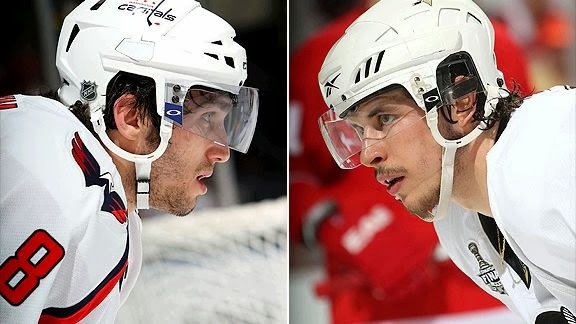 Well, with all do respect to Sidney Crosby, Alexander Ovechkin and the hockey world's insatiable thirst for arguably the two greatest players on the planet to go toe-to-toe, there's more to it than Sid and Ovie. Because, in reality, this is a rivalry rooted in the old Patrick Division, a hatred formed in the mid-'90s as the two squads seemingly met almost annually in the postseason. So, with that spirit in mind, we decided to revisit three of the greatest moments in the Pens-Caps storied history. Assuming, of course, you're a fan of the Penguins. The first of several dramatic comebacks engineered by the Pens against Washington, this series allowed Pittsburgh to eventually repeat as Cup champions. Following a pair of drubbings in D.C., the Penguins returned home to climb back in the series with a Game 3 victory. But, with Dino Ciccarelli exploding for four goals in 7-2 blowout in Game 4, Pittsburgh headed back to Washington facing elimination. Following a 5-2 road win in Game 5, the Penguins returned home with momentum...and Mario Lemieux. Trailing 4-2 in Game 6, Lemieux took over, leading a furious comeback as Pittsburgh posted a 6-4 win thanks to Mario's two markers and three assists. From there, the Washington collapse was imminent. They had no answer for Lemieux, who posted another goal and assist in Game 7 as the Pens completed their unlikely comeback. Obviously, we couldn't leave the only postseason match-up of this "era" off the list. After all, the epic clash provided fans with one of the most exciting playoff bouts in recent memory. A seven game marathon, the series had it all - overtime contests, unstoppable superstars, highlight reel saves and improbable comebacks. Initially, everything went the Caps way (as usual) in the second round match-up. Following a blow for blow performance put on by Crosby and Ovechkin in Game 2 in which the Pens came up short, Washington led the series 2-0. Pittsburgh, however, would take the next three, thanks largely to a pair of overtime winners courtesy of Kris Letang and Evgeni Malkin. When David Steckel returned the favor in Game 6, though, it set the stage for one of the most anticipated contests in NHL history. And, while the 6-2 final proved rather anticlimactic, it was Marc-Andre Fleury that set the tone for the eventual Pittsburgh romp. Staring down Ovie on an early breakaway, The Flower stoned the previously unstoppable Ovechkin, silencing a shocked Verizon Center that seemed as much puzzled as disappointed. The Capitals would never recover as Crosby and the Pens jumped all over Washington en route to clinching the series and, eventually, the club's third Stanley Cup. Entering Game 4 trailing 2-1 in the series, the Penguins persevered in the fifth longest tilt in NHL history as they knotted their first round match-up with the Capitals. After coming back from a 2-0 deficit to force overtime, Ken Wregget stopped Joe Juneau's penalty shot in the second overtime to keep Pittsburgh's hopes alive. Finally, after over 79 minutes of extra time, Petr Nedved beat a screened Olaf Kolzig for one of the Pens' most memorable goals in franchise history. Pittsburgh would ride the momentum from that marathon victory to capture the next two contests, clinching a six game series victory. It would mark the third time in five years the Penguins had ended Washington's season; and it was largely due to that iconic Nedved tally in the fourth overtime of Game 4. All told, those victories helped develop the hatred that now exists between the Penguins and Capitals. And, with all the links, talent and history between the clubs, theirs is a rivalry that will only grow as the squads share a home in the Metropolitan Division.